The following advanced configuration options are presented through the Systems module in order to define settings for virtualized entities such as: Define filters for the records in the external data source tables, specify if a column (field) at the source will be disregarded, etc. Locate the System set for Virtualization, by clicking in the Systems module on the left panel. 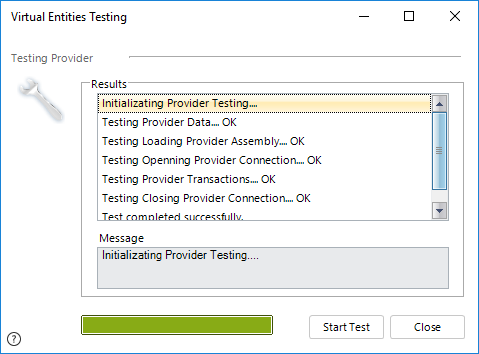 To verify that the provider was properly configured and make sure the connection is successful, the provider can be tested from Bizagi Studio. This test requires using IIS, and can be done before proceeding to configure the replicated or virtual entities. It will diagnose if the connection to the external source can be established successfully. To do this, select the provider and right-click to choose the Test Provider option (or click the button in the standard menu bar as shown). In the opened window, click the Start Test button. A provider that is properly configured, will show all the operations with an OK result status. The Test provider feature requires that the IIS (Internet Information Services) is used as the web server for the Bizagi project. The IIS should be up and running (IIS Installation), and the project's web application folder should have security settings that allow anonymous authentication. Failed provider test message triggered when the IIS the conditions alerted above are not met should read: "The web application is not available...". 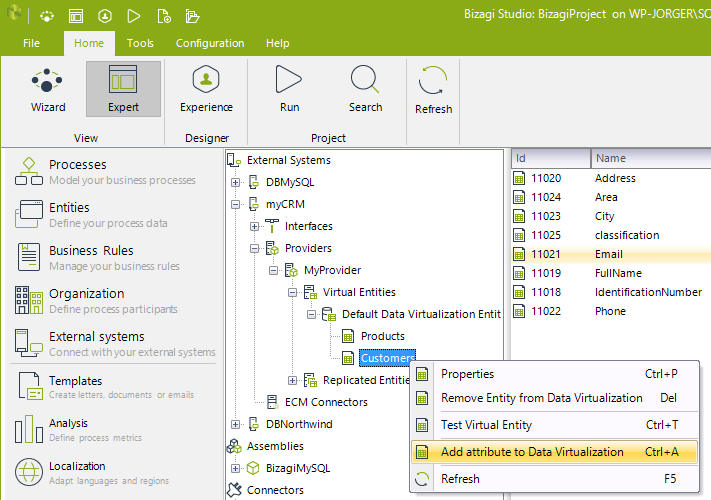 To verify that a virtual entity was properly configured and that the permissions in the external source are met (to read from and write into the source), each virtual entity can be tested from Bizagi Studio. 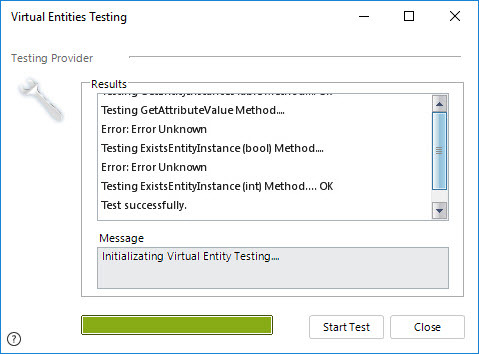 To do this, click the given virtual entity and choose the Test Virtual Entity option. This option uses the IIS to perform testing. A virtual entity that is properly configured, will show all the verification operations ending up with an OK result. Virtual entities present an option to stop synchronization with the external data source. 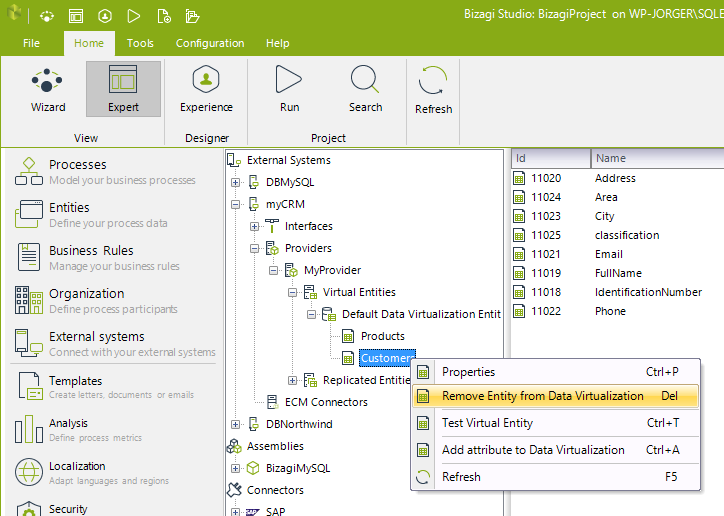 The Remove entity from Data Virtualization option does not delete the entity from the data model itself; it deselects the entity from the Virtualization feature (so that this integration mechanism is no longer used for that entity). This feature is available for the Development environment only if this Entity has not been yet deployed to a Production Environment. Once an entity is removed from Virtualization, it still can be used, and the values of that entity used up (referenced) until that moment would remain the same. 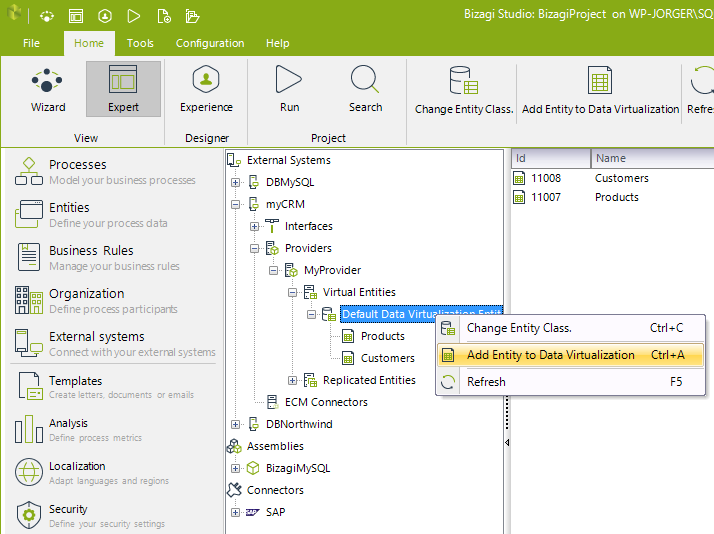 You may choose to add any Master Entity created after setting up Virtualization in Bizagi. 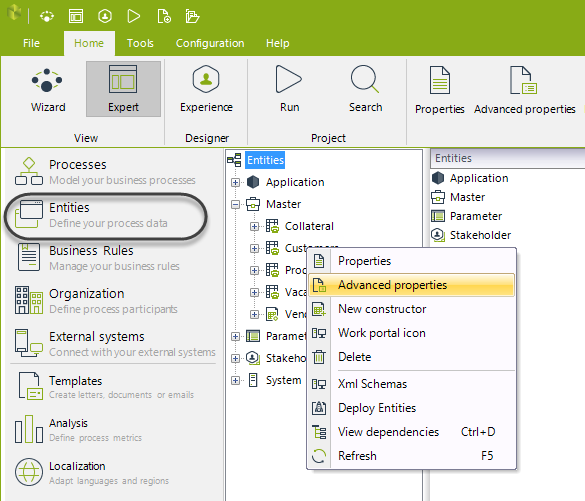 To include a new Master Entity, use the Add Entity to Data Virtualization option. Through this option, you would include an entity as it is done Using advanced Virtualization configuration. Remember to map your entity's attributes to the source's column. 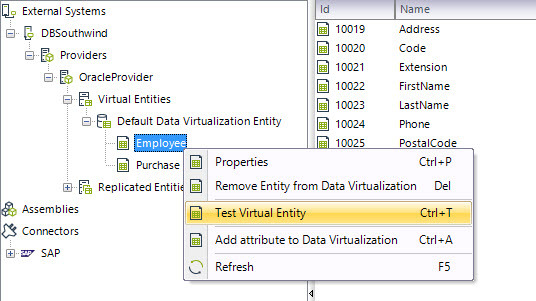 Virtual entities present an option to remove attributes from that Virtualization configuration (especially useful when automatically included by the Wizard). The un-virtualized attribute would still exist in the entity and can be used in the Process, but it would no longer be synchronized with the external data source. This option is useful to make sure that the data we are mapping and synchronizing in runtime constitutes the proper and necessary information (and unnecessary information is not updated). This aids in keeping up good performance in data-level integrations. 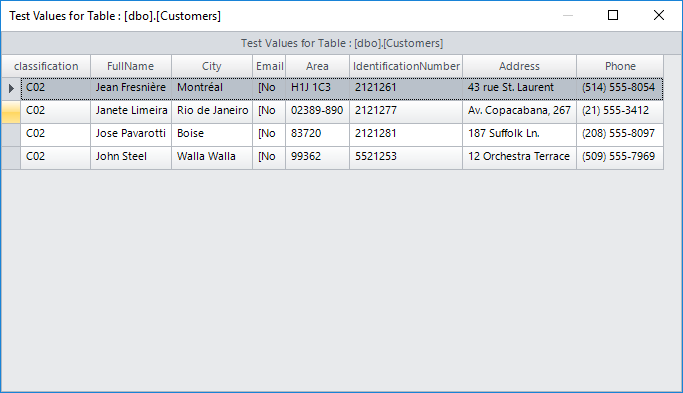 This option is also useful for columns that are references to other external tables which we may not be necessarily using in Bizagi. Virtualized entities present an option to include additional attributes in their configuration (usually when the table's structure in the external data source has been changed after the initial setup has been done, and Virtualization is already working). This option would require the following. 1. The new attribute must first be created in the Master Entity in Bizagi. 2. The attribute must then be added to Virtualization, and mapped to the external source column in order to match the source. When setting up Virtualization through the Wizard, you may initially define a filter for each of your virtualized entities. This is applicable when running your processes in a .NET platform. Using filters is a business-oriented option to avoid integration considering some records at the source which may be of no interest in Bizagi (e.g, synchronizing only a given set of Customers). 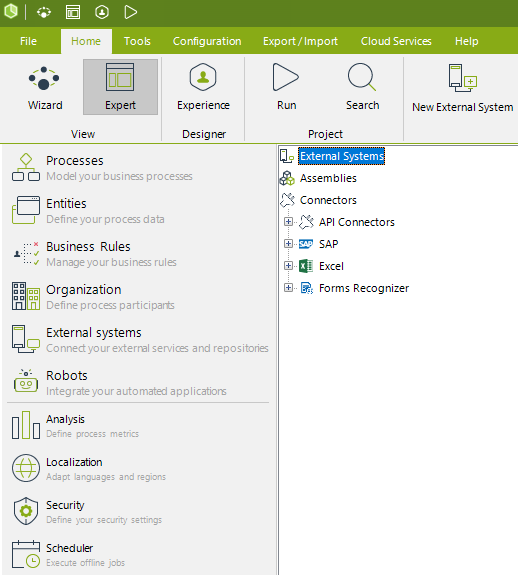 To review or edit this set filter, or when configuring Virtualization through the advanced options (that is, when going through the options presented in the Systems module), go to the Entities module. Right-click at the Master Entity which has been set for Virtualization and select its Advanced properties. Under the Source Filter tab, review or edit the applied filter. Notice that you may use the Test Source Filter option to test this filter and obtain a preview of incoming values from the source. Once a project using Virtualization has been deployed to Production, it will not be possible to delete the Data Providers used by Processes. 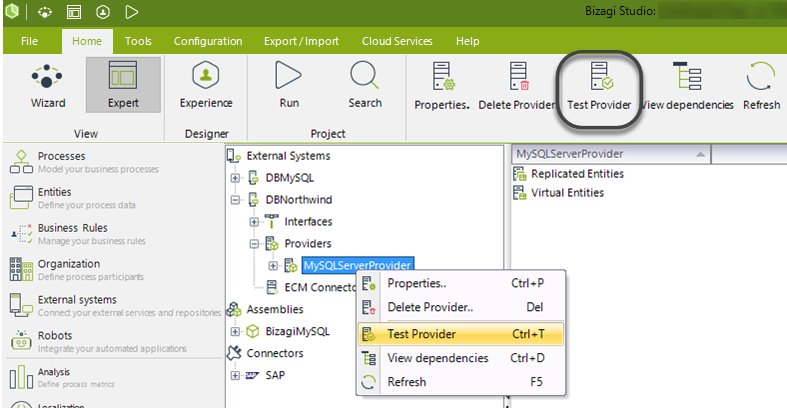 Management of the values for these Data Providers in the Test or the Production Environment needs to be done directly through the Management Console options (managed for each environment separately). To view more information about management in such environments, refer to Bizagi Management Console.